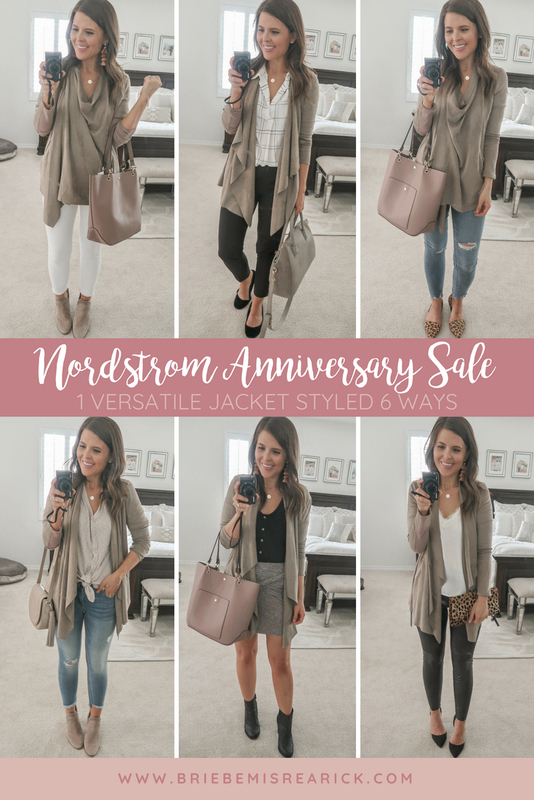 Today might be my favorite Nordstrom Anniversary Sale post I’ve done in all four years I’ve covered the sale! 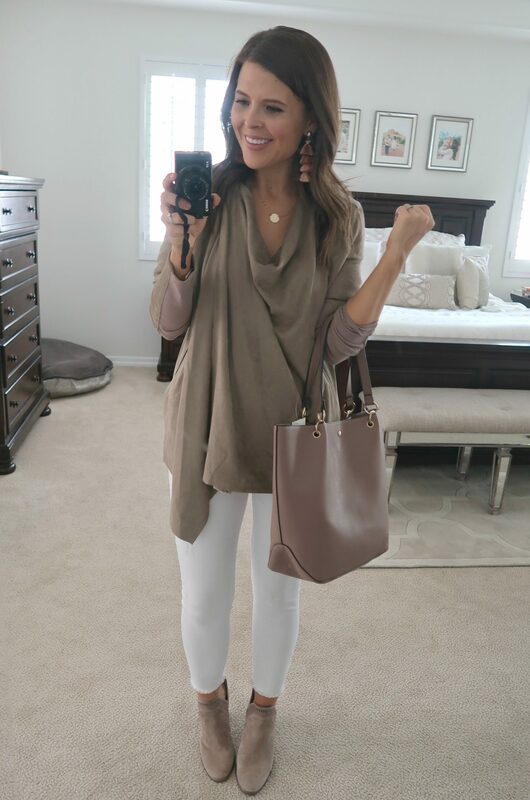 I styled my absolute favorite item from this year’s Nordstrom Anniversary Sale, the BLANKNYC Cloud Nine Drape Jacket, six different ways and easily could’ve styled it another six ways if I wanted to! It’s seriously so versatile and the options are endless. It’s also the softest and most comfortable jacket that I’ve ever worn. My sister and mother-in-law both tried it on and immediately purchased their own! It comes in three perfect colors for fall – taupe, black, and merlot. It’s currently on sale for $59.90 but the price will go up to $90.00 once the sale is over. If you’re a Nordstrom cardholder, don’t miss out on this amazing deal while sizes are still in stock! Items are likely to sell out even faster once the sale goes public on Friday. Check out my full post for six easy ways to style the jacket with lots of items you probably already have in your closet! I’d love to hear which style is your favorite. 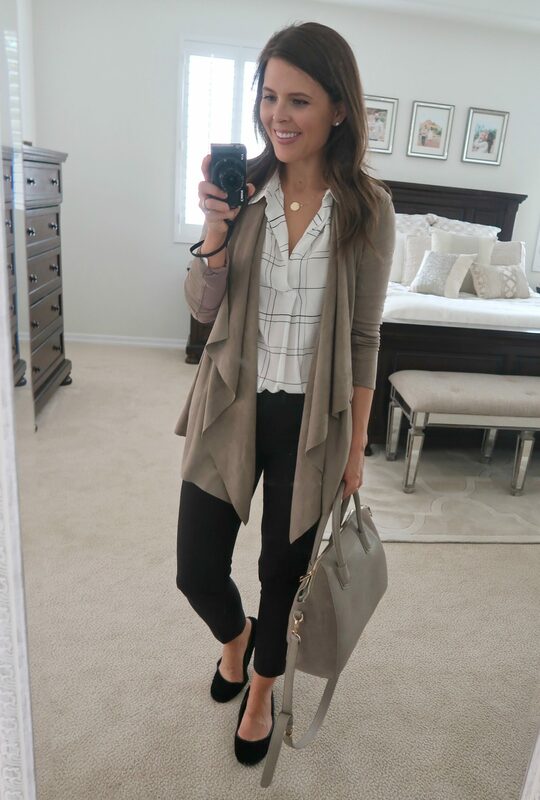 I styled the jacket to wear to work with a plaid blouse and my favorite dress pants. 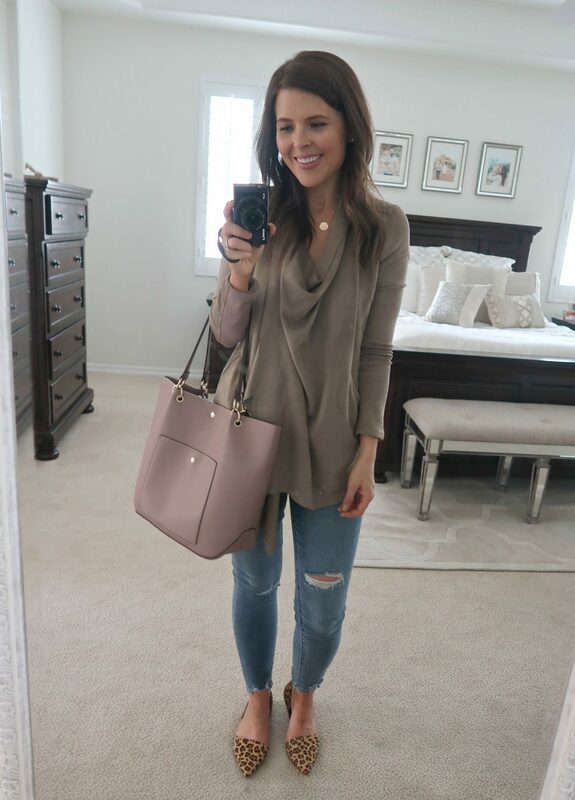 I added a pair of black flats and a matching taupe bag to complete the look. I love the way the jacket looks buttoned up! I think it completely transforms the look and is so easy to button with the magnetic snap. It’s no secret that I’m neutrals obsessed, so I wore the jacket with white denim and I think they look amazing paired together. 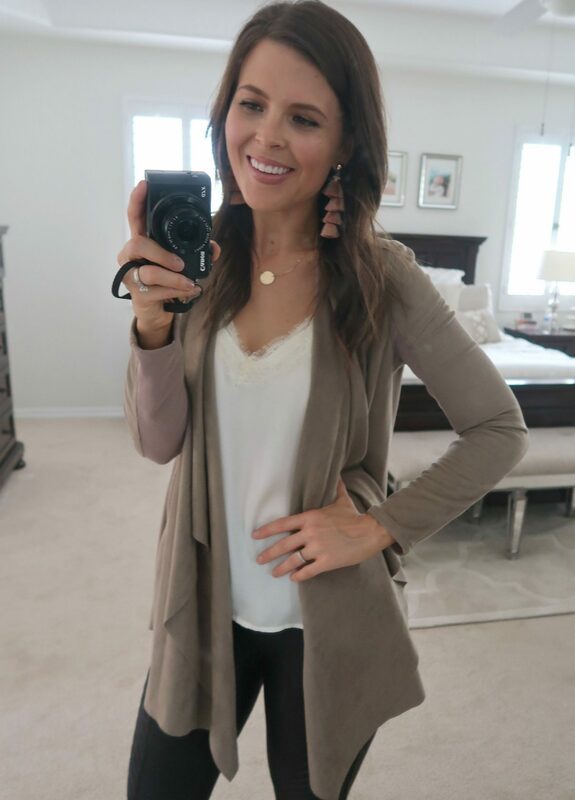 Taupe is definitely my most worn neutral so I figured why not just pair the jacket with a few more of my most worn taupe pieces in my closet? The booties I’m wearing are actually from last year’s sale but I linked to a similar pair that I love from this year’s sale! I picked up these jeans from the sale and love wash of the denim. The jacket and this skirt was definitely the most unexpected combo but I ended up loving it! There’s a gorgeous suede skirt on sale that would also look amazing with it. It’s currently running low on sizes but hopefully they’ll restock it! I don’t have as much “going out” clothing in my closet now that I spend most of my day chasing around a toddler. On the rare occasion that Colton and I do get a night out, I always have a hard time figuring out what to wear. I’m happy to report that this jacket can be dressed up and I’ll likely be wearing it every chance we get a date night in the fall/winter. Whenever my outfit feels a little too boring, I like to add a subtle pop of print. 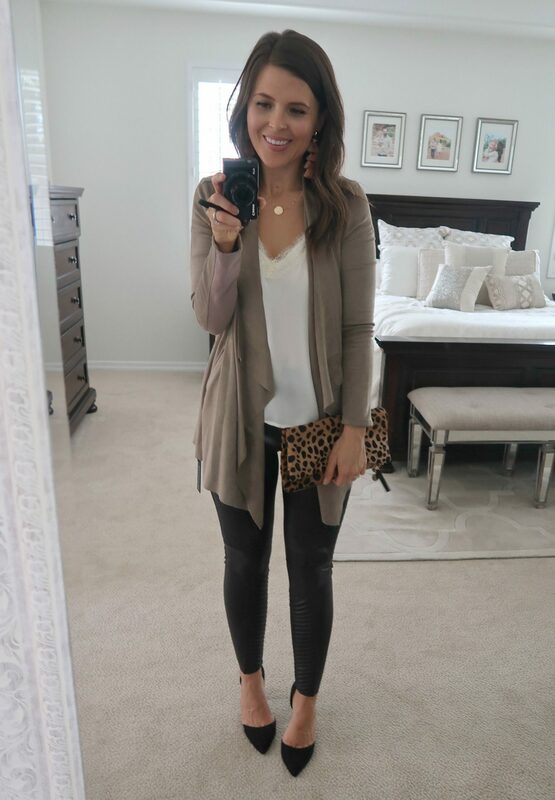 These leopard flats did the trick for an easy everyday look. 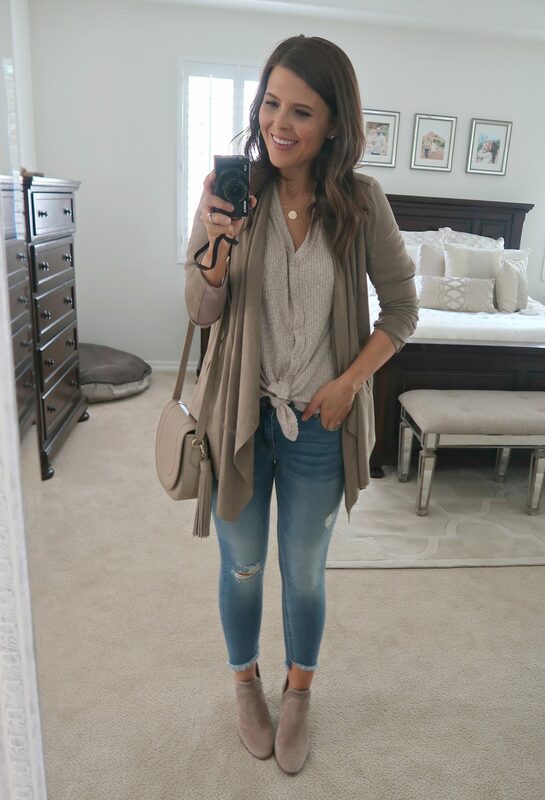 Love how you styled this cardigan. Thank you, Amy! I hope you have a great weekend! Love these looks! 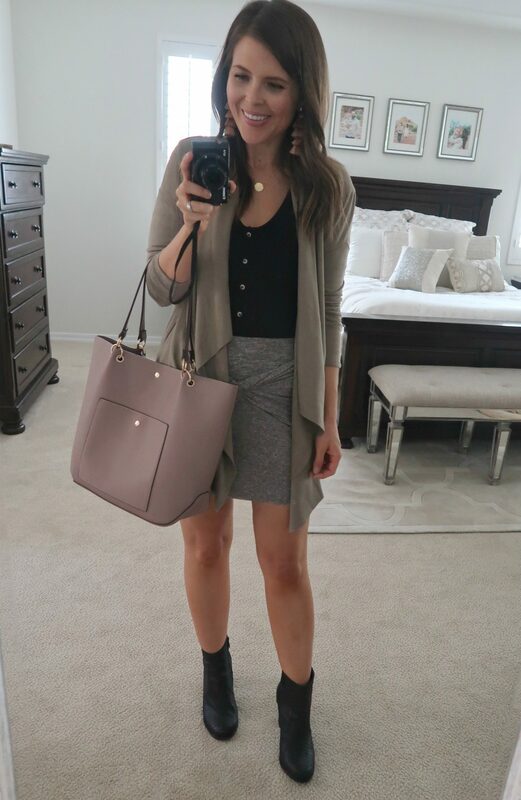 I got this cardigan in black and I am so excited to style it! I hope you love it! My mother-in-law got it in black and now I think I might need it too!